We live in a society that is wrapped up in possessions more than anything else: big houses, expensive cars, new clothes, et cetera. 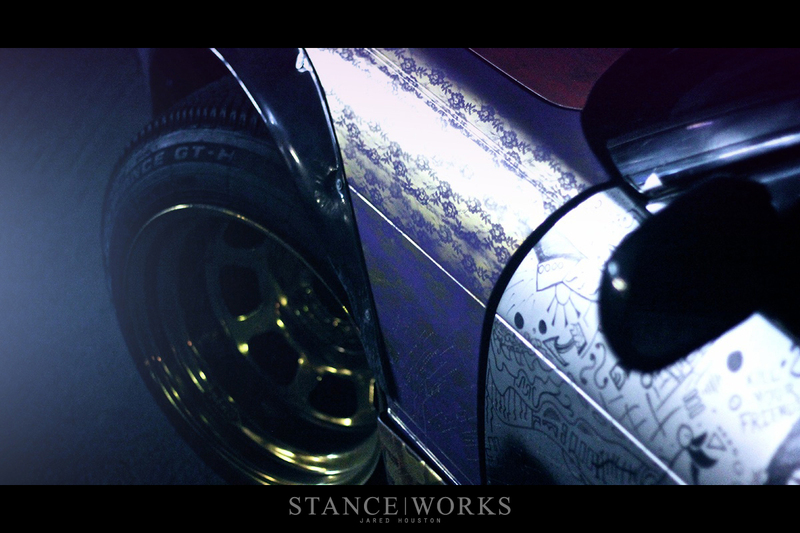 Even in the car scene, people worry about how long your modlist is or how much your wheels cost. This has led to the loss of some of the soul the community used to have. It’s full of people trying to out-do the next guy and full of people putting each other's builds down. Sure, this isn’t everyone, but sadly it’s something we see everywhere, whether you want to admit it or not. 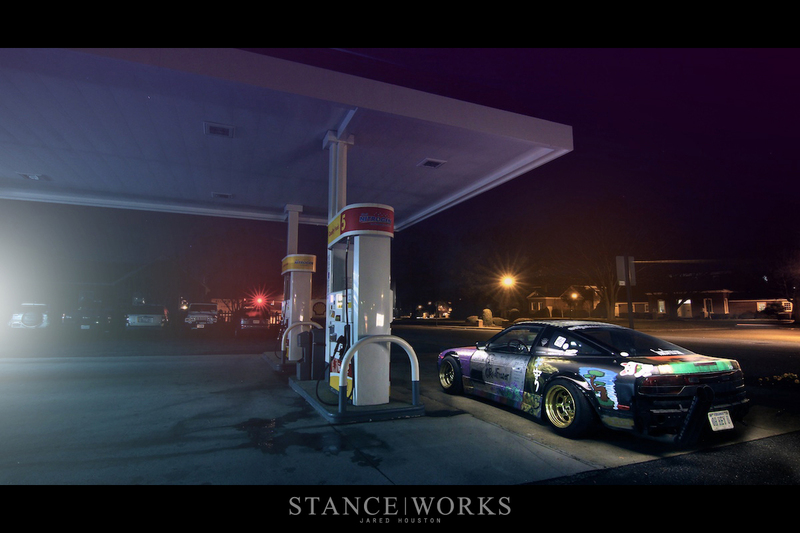 But there are still some out there that simply build their own way; they don’t care if their car is too "safe" by scene standards or too radical for the general public’s taste. Instead of trying to please the “crowd”, they build something to enjoy; something that reflects their own style or tastes. 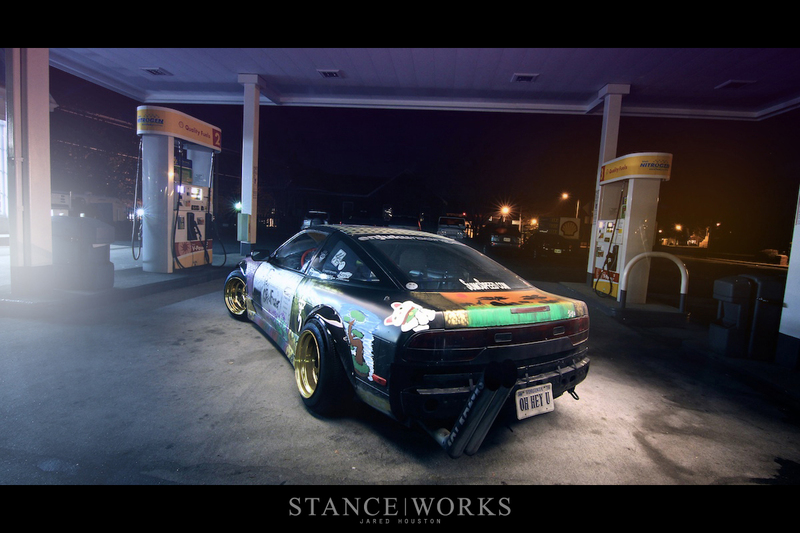 The crazed S13, owned by Reid Fraser, that spans across your screen isn’t for everyone, but it features a key modification that most builds featuring long mod lists and fancy bolted on parts are missing… passion. 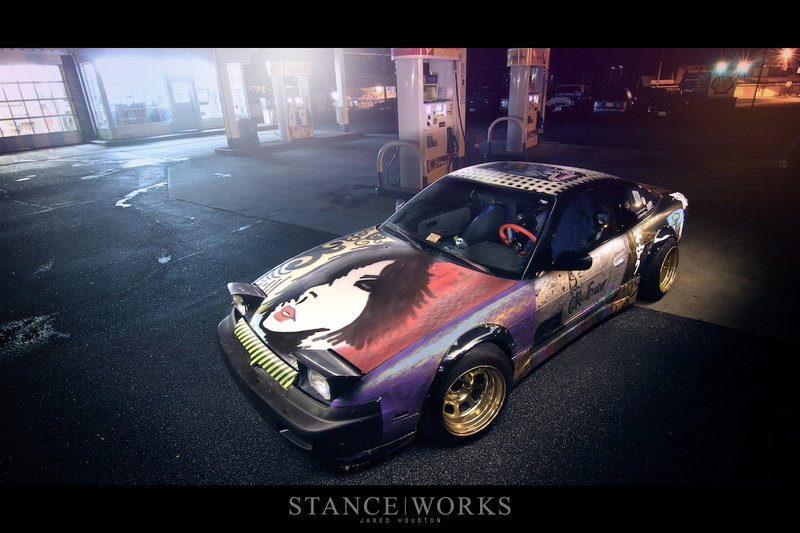 Reid first was introduced to this S13 when he was bored with his DC Integra at the time. He had been yearning for a drift car, as he had been around drifting for years, but never got the chance to really get out on his own to slide around the corners. 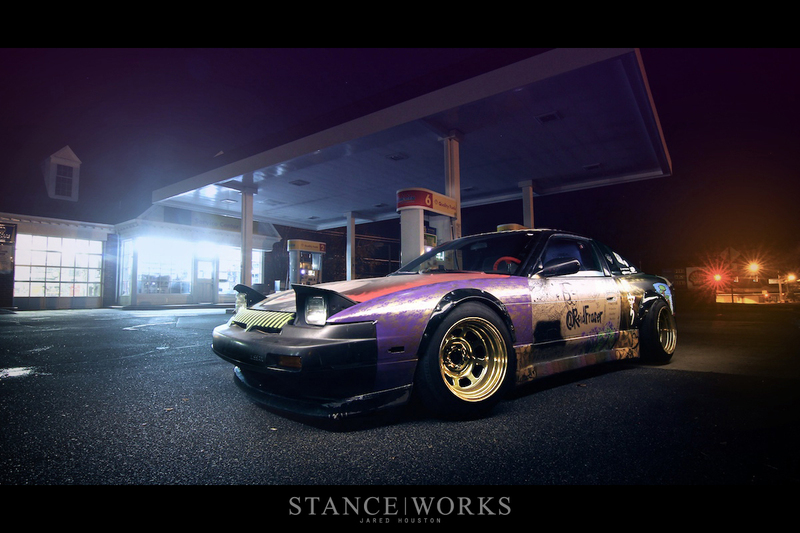 Luckily for Reid, a friend of his was more than interested in his Integra and happened to have an SR20-swapped S13 to offer in trade. He instantly leapt at the chance to have his very own 240, so keys and titles were exchanged and Reid was the proud new owner of an S13 that would grow into the very 240 we see today. Under the hood is a fresh SR20DET, which over the past five or six years has become a popular motor with the drifting crowd; even BMW E30 owners have come to love the motor due to its power and oil pan clearance. To help focus the new found power, the suspension has been revamped and features a set of Powered by Max Coilovers. 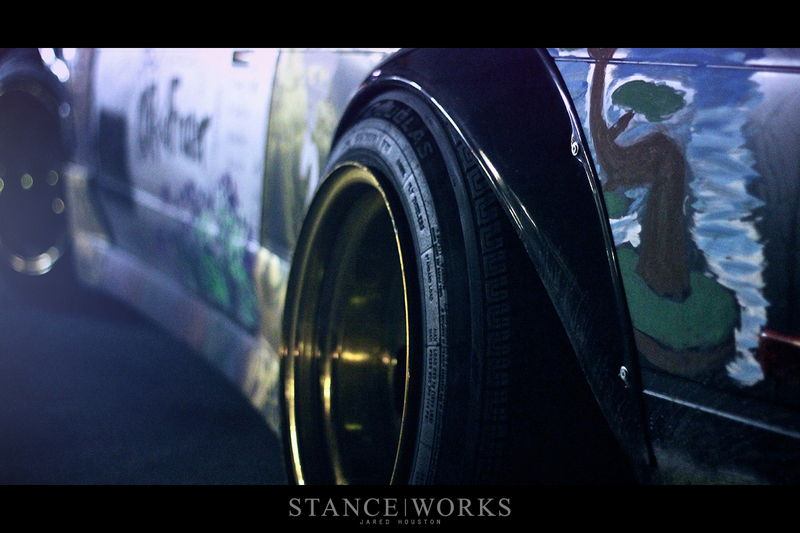 One of the biggest challenges Reid faced with this build was fitting the 15x10 Aero Race wheels under his S13. Due to caliper clearance issues, he had to add a 15mm spacer up front putting the final offset at -53. 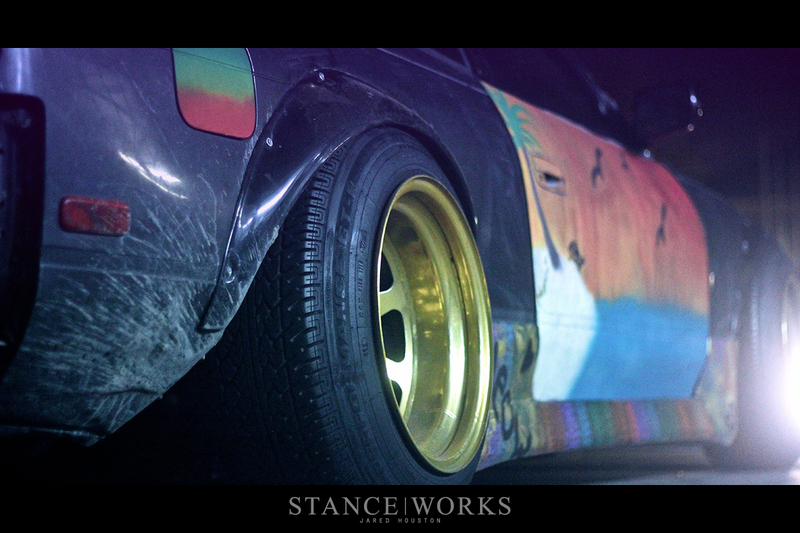 With the front poking as much as it did, Reid threw 25mm spacers in the rear to give it the look he wanted. Most cars that are dedicated track cars usually don’t get a whole lot of time or money spent on cosmetics, because let’s face it, who knows how long it will last. Reid thought otherwise, however; his whole build has just been by the seat of his pants, doing whatever he pleases and not worrying about what everyone was going to think. 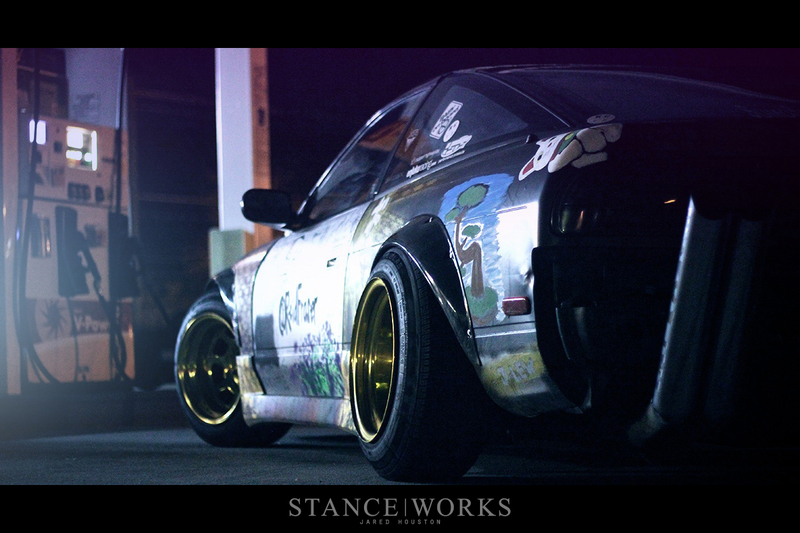 This attitude, especially when it came to the exterior, is why Reid’s S13 stands out. It has been built to enjoy, to remind him of friends and the good times that have been had, which is very apparent as he enlisted those very friends to help out with the one of a kind paint scheme. Accompanied by the one-off paint job, Reid also added Chuki sideskirts and fender flares to help with the poke of the low offsets but also to add to its ready-for-war look. 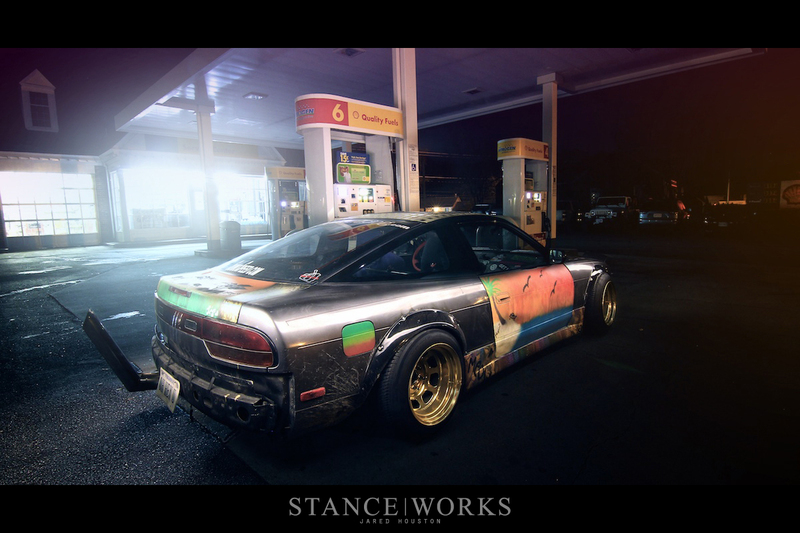 The finishing touch for Reid and his 240 is the Bosozoku-inspired exhaust which adds to this S13’s unique look. 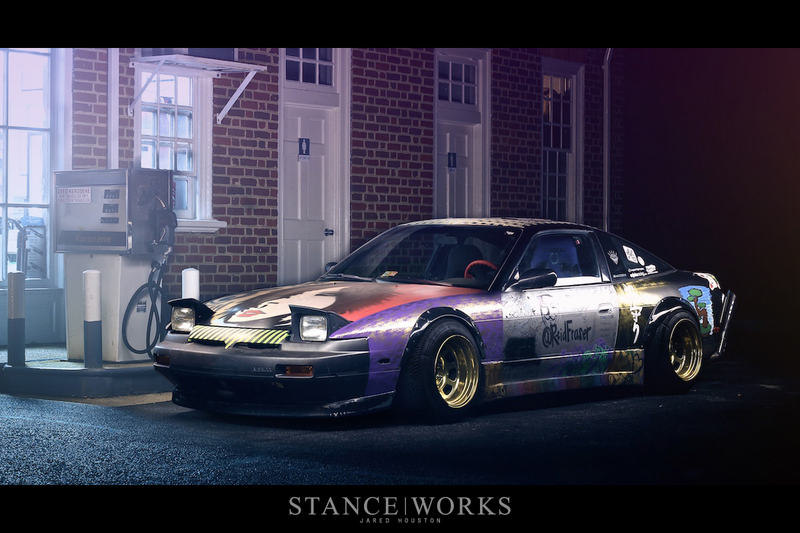 You see a majority of cars out there worried about getting noticed, getting recognized whether it’s by way of features or trophies which is why they go a certain direction or go with a certain modification but Reid’s S13 is a prime example that doing your own thing is the best direction of all. “The car wasn't built to win shows or please everyone. It’s just been something fun to do.” That is a part of the scene that has started to slowly fade, but hopefully cars like Reid’s can bring the scene a second wind. I know exactly where this is at and I’ve never seen this car around, looks like a really nice build though but where does the rain go if it gets in the tailpipes?